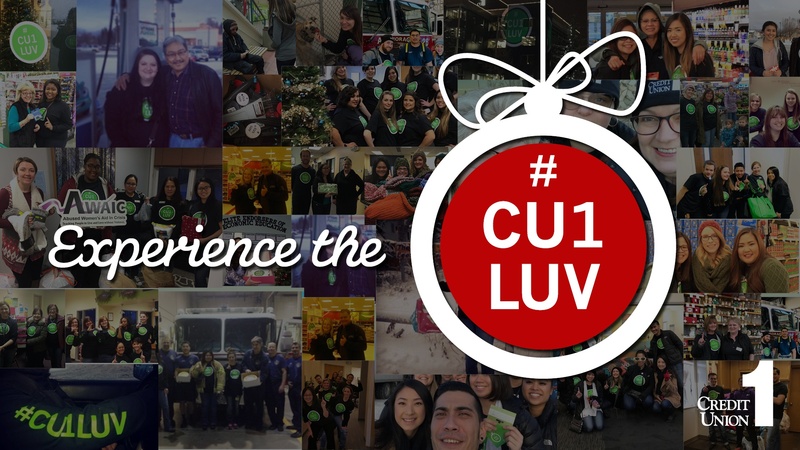 Anchorage, AK – November 26, 2018 – Credit Union 1 (CU1) has announced its fifth annual celebration of #GivingTuesday with over $20,000 in donations and acts of kindness to be shared by CU1 employees throughout Alaska on Tuesday, November 27.
Credit Union 1’s #GivingTuesday efforts aim to inspire and empower Alaskans statewide with #CU1LUV and the spirit of giving. Toward this goal, the credit union will provide over $20,000 to its employees, who in turn use these funds in whatever “giving” capacity they choose. This year’s impacted communities will include: Anchorage, Eagle River, Wasilla, Palmer, Nome, Fairbanks, Soldotna, Ketchikan and Kodiak. Donations and gifts will be delivered to a variety of local nonprofit organizations, and in addition, a portion of funds will be used to complete “random acts of kindness” such as paying for Alaskans’ utilities, groceries, gas or meals, handing out hats, scarves and gloves at bus stops, and delivering gifts and goodies to local senior citizen centers and shelters. Credit Union 1 has a history of being community-minded and socially responsible in Alaska since 1952, and this giving spirit will be particularly impactful on #GivingTuesday as their employees take to the streets to spread kindness and philanthropy. - James Wileman, President/CEO at Credit Union 1. In addition to charitable donations made statewide on #GivingTuesday, Credit Union 1 will also launch its new online charitable giving platform on Tuesday, which allows credit union members to give back to the local charities they care about directly through their home banking service. Details are available at cu1.org/community.